A scaleup is definited as, a business that has grown turnover or employees by more than 20% per year over a period of at least three years. On the face of it, growing the number of scaleups in the North East from 420 to 630 doesn’t seem too big a challenge. If only that were true! Of the 420 businesses who were achieving scaleup levels of performance in 2014, only approximately 25% were still scaling in 2016. This begins to unveil the size of the challenge. In addition, the Enterprise Research Centre UK Local Growth Dashboard 2017 identified that the North East LEP area lags behind the UK average in terms of both start-ups scaling beyond £1m, and businesses with a turnover of between £1 to £2 million scaling beyond £3million. To meet our goal of increasing the density of scaleup businesses by 50% then the economy needs to see more businesses with high growth potential achieving these levels of growth, and for more existing scaleups to continue growing and break through the elusive £3million barrier. The key question is how will the North East do it? How can we create an ecosystem that will deliver the goal? The first thing we need to do is to capitalise on what we already have. One of the great advantages that the North East holds above any other region is the strength of the business community, who have a shared love and passion for the North East. We’ve seen this through the sheer numbers of leaders who dedicate their time to mentoring others, this is incredibly powerful because if you’re in business and if you have a problem then in all likelihood someone else has had the same problem and chances are they have already solved it – so why not learn from their experience. To join the dots and align and mobilise the North East’s collective energy, resource and passion, the North East Growth Hub has been working with the business community to think about how we can create an ecosystem that will enable more businesses to scale. 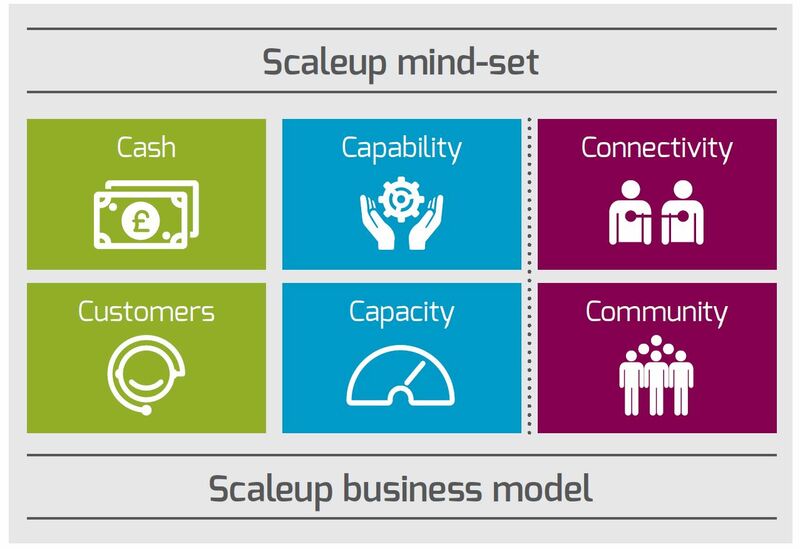 This has led to the ‘Scaleup Ecosystem Model’, which aims to present a framework to focus our efforts in overcoming the common challenges faced by scaleups and enabling the things that enable businesses to achieve high growth performance. Future blogs will cover the sections of the model in more detail from scaleup mindset and business models to cash and capacity, meanwhile let us know what you think, join the debate, suggest how you can help and together lets unleash the power of the North East’s business community.